In this activity, pupils created visual aids for teaching mathematics, searched for suitable teaching programs and prepared validation tests. 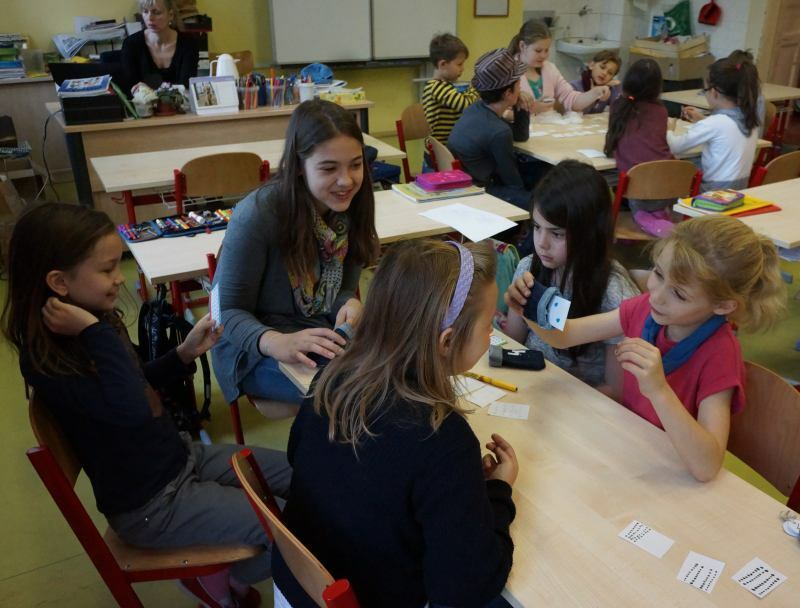 They taught a mathematics lesson for second-graders and documented their activities. The activity was participated by 2.B (22 pupils) and 6.A (24 pupils) in Mathematics and Computer Science lessons. In overall, the activity covered 10 lessons during which the pupils become familiar with the project, were divided into groups, studied multiplication, visited 2.B, prepared the curriculum (ideas, teaching methods, approval and production teaching aids, use of digital technology – tablet, camera, video camera, creating tests in Smart Notebook program, implementation of the curriculum and tests). I had problems because the girls weren’t prepared, they didn’t bring anything. I had problems because of children’s behaviour. I didn’t have any problems, but one boy had a lot of problems and he started crying, but in the end, he learnt how to do that. Everything was very quickly for me. I had problems with making some test. I had a little problem with general organisation. You have worked with digital technics? We used the announced equipment Ipad. I made video films and took photos. I would like to have better order in class – not so much talking , but more listening. I would like to be more prepared for the aktivity. I would like to have more cooperation. I would like to work with other people, because in our group two girls always quarelled. I would like everyone to work in team and quietly. I would like to have more bonbones. It worked out, so I wouldn’t change anything. I would like to bring my own materiál. I think everything was well-done. I learnt how to work with children. I learnt how to teach children to cooperate. I learnt how work with interactive tables. I learnt how to teach other people. It is quite difficult. I learnt how to teach other children. I don’t know whether our teacher gained any new experience. I understood that cooperation is very important. I learnt how to calculate. I learnt how to cooperate with elder and younger children. Now I know that I can teach.